We have updated our tool for in-person consumer assistance staff to use when helping consumers evaluate and select a plan, called the Marketplace Plan Comparison Worksheet [Spanish Version]. After consumers obtain a tax credit determination, their health plan search tends to narrow down to a handful of plans that fall into a target price range (often three to five plans). 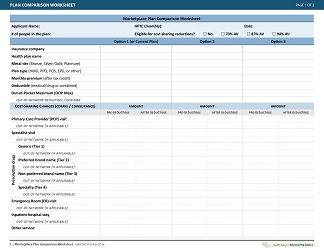 This worksheet is intended for assisters to use with consumers to note the differences between several plans, compare and contrast them, and identify which plan best meets their needs.